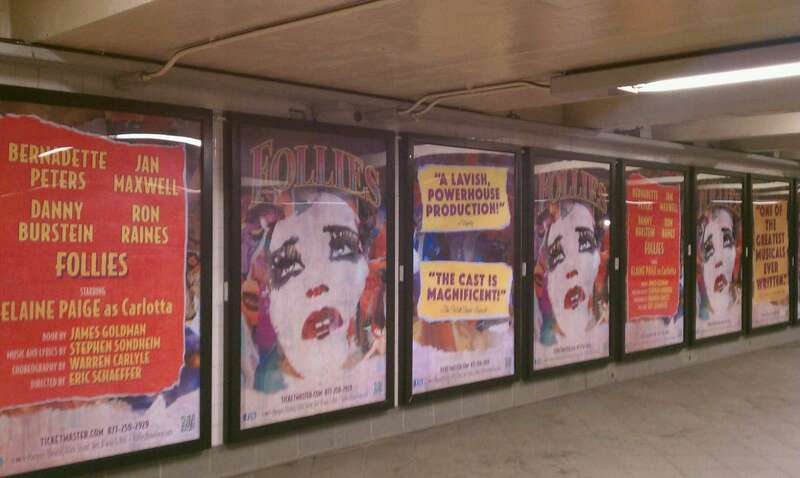 Adventures in the Endless Pursuit of Entertainment: Follies on Broadway! Yesterday I saw these Follies ads on the 1 train downtown platform at the ﻿59th Street station. It slightly elevated my excitement that the Kennedy Center's production of Follies is actually going to open on Broadway! In fact, the first preview is only about 10 days away on August 7th at the Marquis Theatre. Opening Night is set for September 12th. I saw the production at the Kennedy Center five times, over two separate weekends. It stars Bernadette Peters, Jan Maxwell, Danny Burstein, Ron Raines, Elaine Paige, Terri White, Rosalind Elias, Jayne Howdyshell, Florence Lacey, Mary Beth Piel, Susan Watson, and Don Correia. I loved the production and can't wait to see it - there are some scenes that I could just hit rewind on and watch over and over. Danny Burstein as Buddy! He's a miracle of acting, singing, and dancing! I never expected such a brilliant and beautiful performance. Elaine Paige's low, bluesy notes on "I'm Still Here" - she reaches right down and delivers them with such soul - it's thrilling! Rosalind Elias sing One More Kiss - it's so pretty! Jan Maxwell's fabulous understated delivery - she knows how to cut you and she will! Bernadette Peters tapping up a storm in The Mirror Number - she was the only one of the leads to put on tap shoes, besides Terri White and it's so much fun! Bernadette Peters deadpanning - so funny! Terri White - oh my gosh, she delivers! She always knocks it out of the park with that gorgeous contralto of hers and she's great hoofer! The ghosts dressed in the most gorgeous eye-popping costumes by Greg Barnes. They SPARKLE! basically, I can't wait to see the whole damn show again (and again)!